In UP, would you rather wear slippers or shoes? 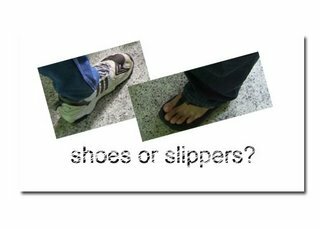 I'd really want to hear your thoughts on this: In UP, would you rather wear slippers or shoes, and why? This is the topic of our Comm3 Panel Discussion. It'd be a great help to know what you think. Special thanks goes to Wegs and Carlo for exposing their footwear to public scrutiny.